As part of my return to the leadership of House Stalwart, there is a ton of base level clean-up that I need to do. One of the first pieces I decided to tackle was shifting any character that has not been online in the last year to “retired” status. So many guilds kick the inactive, but I have never really liked that concept. It feels harsh since in my experience so many people renew their subscription on a whim. Logging back in to a friendly guild that has missed them, is a much more enjoyable experience than finding out they have been booted out into the cold. This is compounded now by the concept of guild faction, that was added in with Cataclysm. Booting a character from a guild has serious repercussions for the player. It takes awhile to get to exalted with a guild, especially at maximum level… so punting folks out and making them potentially redo all that faction work just seems cruel. Setting them to retired rank seems like a good solution, since I have stripped that rank of all bank privileges to protect the guild from someone getting hacked, but if someone does return for a length of time I can bump them back up to an active rank. I had originally planned on doing this for anyone that had been gone for over 6 months… but ended up calling it quits after finishing with the “1 year” folks. It took me what felt like an hour to get that far through the list. I can only imagine what it is going to be line when I redo every single one of the almost 900 characters guild notes. One of my goals is to do a guild census of sorts… get to know every single person that is in the guild that joined during my 2 year absence. Part of this is to set accurate guild notes that follow a pattern so that you can use addons like Prat to merge the two in chat. One of the concepts that I have latched on over the last few weeks is the idea of a WoW Bucket List. The first time I had actually seen this in a formalized form was over on Cuppyville, where she proudly lists her WoW Bucket List in the top menu of her site. I don’t quite have my formalized enough for that, but I have started a Google Docs Spreadsheet and as I think of things have begun adding them to it. Always in the past when I have left WoW, it has been because I “ran out of things to do”. I say that in quotes, because really that was never the case in actuality. There are far too many things to do to have ever been “done” with the game. What happened instead is I got frustrated and lost sight of the things I wanted to do once upon a time… but have long forgotten about. My theory is that in keeping this bucket list, I will be able to pick things off of it on those rainy days when I can’t think of anything worth doing. Now several of them do require lots of people to complete, like finishing off my Glory of the Icecrown Raider achievements that I am missing only a couple of sub achievements on. But I had a conversation with a guild member last night and we talked about having some sort of a rotating raid achievement night for old school content. I love ticking off these things, and its even better when you can help a whole group full of people check those goals off as well. One of the most amazing bloggers/podcasters… @AlternativeChat constantly extolls the virtues of “Faffing about”, that is doing the piddly little things that only really matter to you. After my hour of wrestling with the guild roster, I was not really in the mood to focus on anything much. I had originally planned on working on questing my way through Hyjal on Gloam, but as I logged in to do just that everything felt “hazy”. Normally this might have been one of those times that I logged out frustrated with not feeling like making “real progress”. However It was at this point my WoW Bucket List paid off. I looked at my long list of objectives and decided that last night would be a mount farming night, as I could chat freely while doing it. Soloing old content is one of my biggest enjoyments in any game. There is so much nostalgia wrapped up in making your way through content that used to require a large group. You feel epic as you trounce monsters that used to trounce you regularly. Had I not raided every last bit of this content, I doubt I would have the massive shot of nostalgia that this gives me… but it almost always guarantees a smile on my face. As a result I started the evening in Tempest Keep, as a friend of mine and I made a contest of it over on our Mumble server. We started at roughly the same time and tried to see who could clear the dungeon first. Neither of us managed to get the fabled Ashes of Al’ar to drop… but last week another guild member did so it has renewed our interests. From there I took a trip over to Utgarde Pinnacle to battle my old nemesis Skadi the Rutheless. Across the board the protodrake model is one of my favorite mount designs, and to the best of my knowledge the only two that are still available that I am missing… are the blue and yellow. While the concept of the Time-Lost Proto Drake intrigues me… and every time I have occasion to be in the area I fly the circuit of spawn points “just in case”… I do not have the fortitude to farm it. 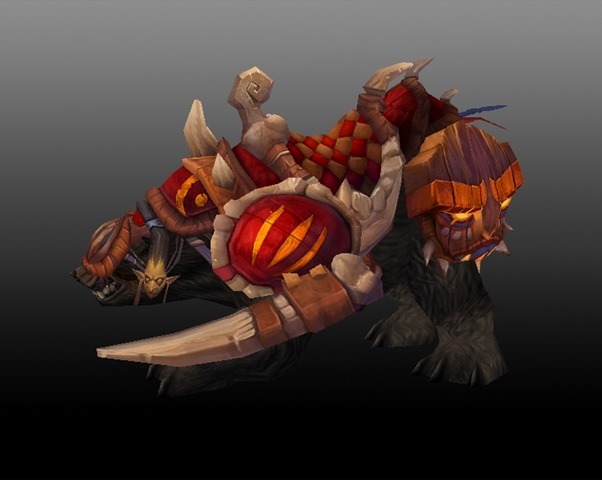 Instead I battle my old nemesis in an attempt to steal his mount whenever I have downtime. I both love and hate the fact that it is heroic, because it limits the amount of grinding I can realistically do in one sitting. Upon failing once again to walk away with that ever elusive proto drake, I moved on to the next target which was The Stonecore. 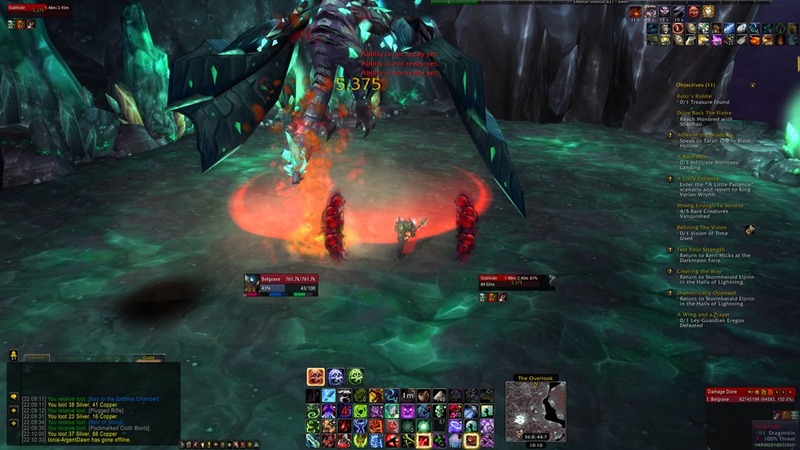 The second boss of the instance, Slabhide has an equal chance of dropping Reins of the Vitreous Stone Drake on both Heroic and Normal. As a result I tend to farm this mount resetting the instance over and over until I reach the instance lockout timer. Honestly this is one of the least frustrating farms I have done in a game, as there is a warp gate immediately after the boss that can take you right back to the instance. So you clear your way down, fight Slabhide and warp back up to the start, zoning out and resetting it. It was on my fourth clear of the night that luck smiled upon me and I got to tick something off of my Bucket List. Here is a gratuitous shot of me riding my new prize immediately after exiting The Stonecore. 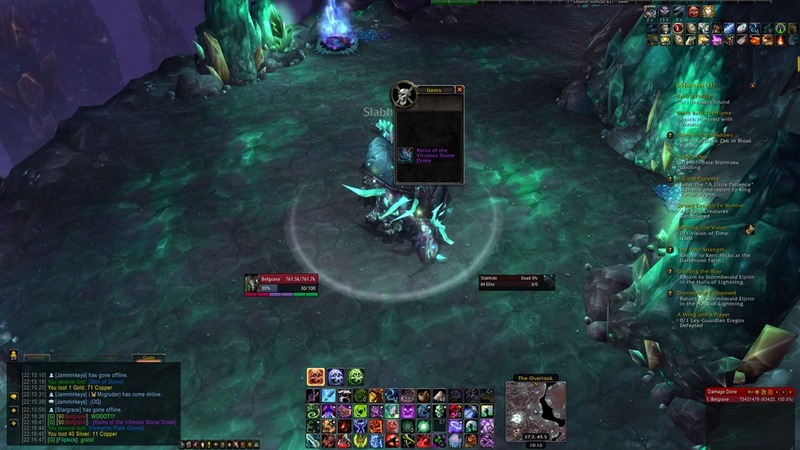 This is my very first of the “stone drake” mounts, as I never managed to complete the heroic achievement for Cataclysm. I ended up leaving only a few months into the expansion, and at that point achievements were just not a priority. I have quite a few of the things ticked off however, so it is on my bucket list of things to finish up. 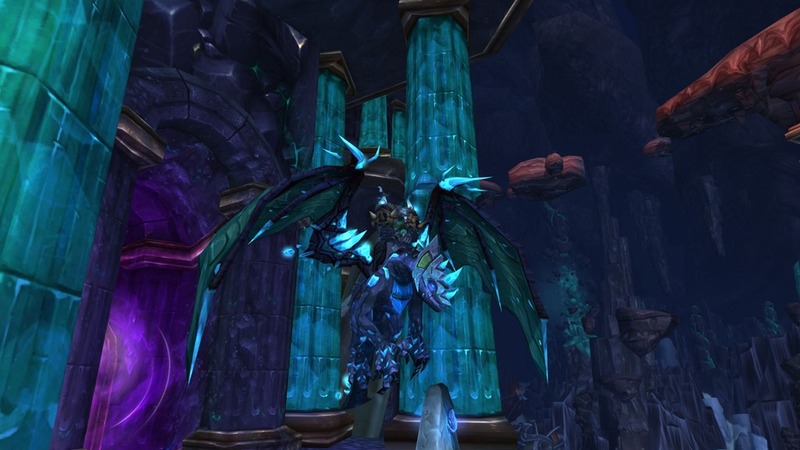 I have to say… the Stone Drake model may give the Proto Drake a run for its money. My absolute least favorite however is the Cloud Serpent model, which has seriously harmed my progress on all of the Pandaria achievements. The moment I got my drake I had to tweet @AlternativeChat to share my moment of faffing paying off. My hope is that tonight I can return to progressing on Gloam, but if not I am sure I will just grab another thing from the list. 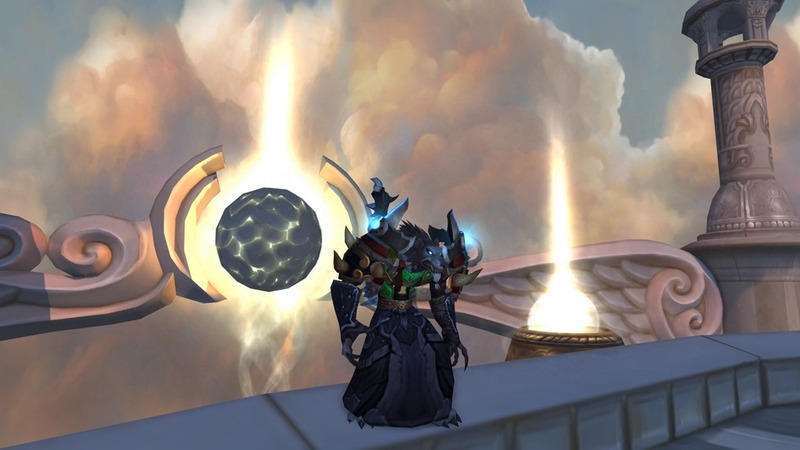 Tuesday I had every intent to work on gloam as well but instead wound up running around the world with a pack of guildies farming the Zandalari Warbringers for an attempt at their mount. So to be honest… my primary plan is to work on Gloam, but I will as always be open to suggestions of alternative paths. Whatever option we end up choosing is completely fine by me, so long as we have fun doing it.